Grrrr... Im just an angry bird *chirp* them gosh darn goof balls are up to no good again. 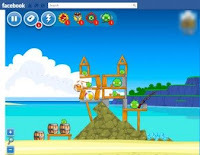 What really needs to be said other than "Angry Birds ON Facebook" its pretty much the same experience you get on the iPad. Now with it on Facebook you can do the typical facebook stuff such as; add friends, send gifts, dress up an avatar, check leaderboard, etc.New features are included such as maps exclusive on Facebook and four new powerups that make difficult maps simple. The Sling Scope: Helps you pinpoint exactly where you want to send your next bird. Birdquake: Shakes the ground, bringing down the green pigs' defenses. Super Seeds: Turns your bird into a Mighty Eagle-sized monster. King Sling: Gives you extra flinging power and speed to do extra damage. If you like playing Angry Bird go check it out. If you want to give it a whirl and see what all the hype is about go ahead. If you played it and weren't a fan or just got bored with it, let me save you the time and just don't bother, it's not like any of us are drawn to a game because you can play with an avatar. Right?